This picture of Neptune shows the Great Dark Spot and its companion bright smudge. Jupiter has Great Red Spot. Did you know that Neptune has also one? It is black! 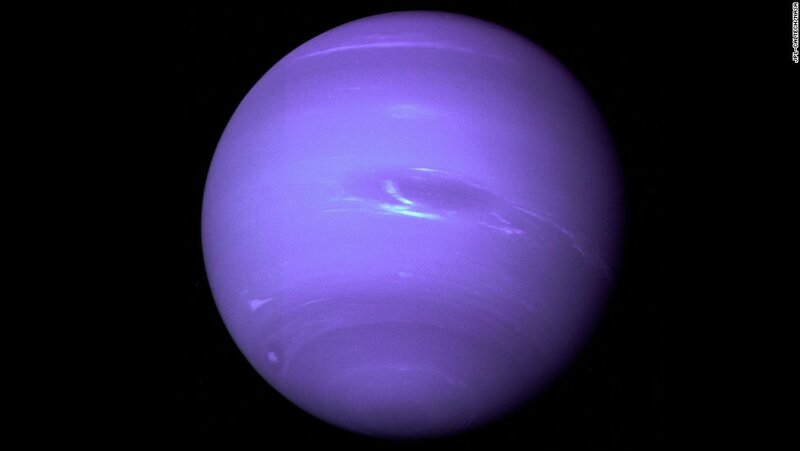 Neptune has had a series of dark spots and the first one that was discovered by the scientists came along in 1989. This dark spot is famously known as Great Dark Spot and was formed in Southern Hemisphere of the planet. A common name of it is GDS-89 which is in accordance with its appearance and the date it was observed. It was first revealed to humans when Voyager 2 spacecraft of NASA flew past Neptune. An exciting thing was that it was pretty much similar to Jupiter’s Great Red Spot. NASA observed Neptune again in 1994 through Hubble Space Telescope and found that this dark spot was gone. Dark spots of Neptune are basically anti-cyclonic storms just like the storms that were discovered on Jupiter. An anti-cyclonic storm is formed usually in a high-pressure system whereas a tornado develops in an area with the low pressure system. This type of storms is accompanied by cold weather and snow-storms, most of the times. The dark spot of Neptune has many dissimilarities with respect to Jupiter’s dark spot. Firstly, they are relatively cloud-free storms. Secondly, the lifetime of both of these dark spots is quite different. The dark spot on Neptune forms and dissipates every few years while the Jupiter’s dark spot lasted for hundreds of years, being the largest (and the longest) storm in the Solar System. This dark spot was elliptical in shape and was nearly as big as Earth. The speed of wind around it was measured to be about 2400 kilometers per hour. This is the fastest speed of wind that is ever experienced by the solar system. There was a theory that this spot represents a hole in the Methane cloud deck of Neptune. 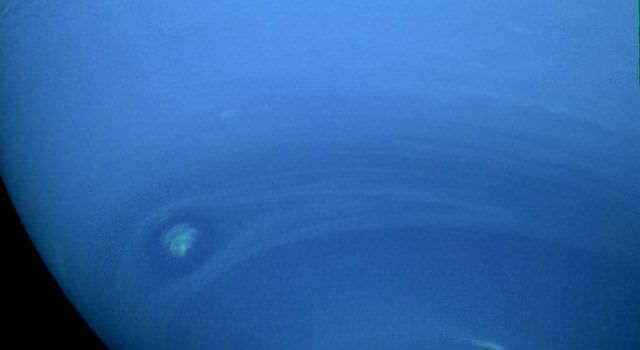 The reason for this was that the clouds that are formed on Neptune are made up of frozen crystals of Methane. These clouds are generated at or just below the tropopause layer. This is identical to high-altitude clouds found on Earth. The only difference is that the clouds on Earth are composed of crystals of ice instead of Methane. In 1994, when Hubble Space Telescope caught images from Neptune, the Great dark spot has diminished but another one was observed in the Northern Hemisphere of the densest planet in our solar system. This new spot was called the Northern Great Dark Spot (NGDS) and was seen for many years to come. There is no clear-cut explanation whether it exists today or not. The next and the most recent of the Neptune’s dark spots were found by NASA in 2016 through their Hubble Space Telescope. The images taken show a dark vortex in the atmosphere of the planet. The images were taken on May 16 and the following statement was published on Hubble site alongside the images. Bright clouds started to emerge on Neptune again in July 2015 and it was observed by all kinds of astronomers. Due to the fact that the vortices can be viewed only in blue wavelength, it is not an easy thing to see that much detail. Only Hubble has that kind of high resolution to extract such fine details at that distance. The diversity in shape, size, and stability of dark vortices is immensely astonishing as the years pass by. Astronomers linked with the study of planets are working continuously to understand the in-depth details of dark vortices. Their main focus is on determining what controls their drifts and oscillations, and how they interact with the environment. This latest sight of a Neptune dark spot is expected to open up new dynamics of the surrounding atmosphere and scientists are hopeful to build stronger reasons behind this amazing climatic effect.